Well, THAT was fun, now wasn't it? Some people love decorating their Christmas tree... others look forward to Valentine's Day every year.... me? I'm a big fan of the 4/1. It's kinda *my* holiday, ya know? Special thanks go out to two incredibly wonderful and cherished friends -- Catherine and Chris -- the wind beneath my April Fool's wings. And you know what? When I read through that April Fool's Day post one last time before pressing the "Publish" button, I thought to myself, hey, wait a minute... that actually sounds like a fun tour, and I wish I could really do it. Well, except for the liquid nitrogen part. And the having to do all that permitting. But cooking my way across the country??? I'd love it. Let's find a way to make that happen, k? I'm serious. Wouldn't that be cool? But before we get started, I wanna tell you about an event here in the DC area I hope you'll come to: Smith Meadows Farm Day. A little over an hour outside DC, Smith Meadows Farm is owned and run by the Pritchard Family. I've gotten to know Forrest and his wife Nancy over the past few years (they're at a few of our local farmers markets), and not only do I think they are awesome, their food is amazing (their chickens are the best you'll find in the area). You can read this interview I did with Forrest, and then, you can go to their web site and sign up for Farm Day -- it's Saturday, May 1st from 10 - 2. The cost is $35 per person ($60 for a couple), and that includes a tour of the farm, some workshops and activities, and a big ole BBQ lunch (featuring their meats). Kids 18 and under get in free. I'm gonna be there, so I hope you'll come out to see a working family farm, and get to know some great people who work harder than anyone I know. I poured that liquid into a large sauce pan, brought it to a boil, and let it boil for 3 minutes. I poured the liquid through a fine-mesh strainer into another large sauce pan (the liquid was about 1" deep) where I skimmed off all the foam and bubbles and brought it up to just below a simmer -- that's when the skin began to form on the top of the liquid. The skin that forms is called yuba, hence the word "yuba" in the title of this dish. How many of you thought "yuba" was short for "yodeling tuba?" Show of hands? I thought so. Shame on you. Especially you, there, in the back. What were you THINKING? Not the most attractive food product I've ever seen, but not the worst, either, I suppose. I made eight of those sticks, which took about two hours -- after one layer of skin was pulled off the surface of the milk, I had to wait another 15-20 minutes for another one to form. There were eight in all, and they all spent about 5 hours in the dehydrator at 135F degrees. It's so easy -- you just start with one egg yolk in a bowl, then whisk in the canola oil, a drop or two at a time, whisking all the while, then adding the oil more steadily as the mayo emulsifies. I love making homemade mayonnaise... and miso mayonnaise? Holy wow, is that good. After whisking the egg yolk and oil, I added red miso paste, the juice of two limes, sugar, water, kosher salt and cayenne pepper. All I need to do now is learn how to make a gluten-free baguette and I will slather this miso mayonnaise on every freakin' sandwich I can think of. The other thing I did while waiting for the soy milk skins to form was peel an orange, go in with a paring knife to remove the pith, cut the peel into long, thin slices, then blanch them in simple syrup. Those long orange peel strips were wrapped around the yuba sticks just before serving. Look! I peeled it all in one piece! I should have my own TV show! Or a recording contract! Or a clothing line! Right? Right. While they blobbed around the pot of hot canola oil for about a minute, I sliced some raw, pink, Florida Keys shrimp lengthwise so they, too, could be wrapped around the now-fried yuba sticks. Shrimp, orange, and miso might just be my new favorite flavor combination. Holy cats, these were good. There were just four of us around the table, and we were pretty psyched to have two apiece. The biting and the re-dunking, and the biting again, and the one last dunking and biting... wow. I think we could've gone through a few dozen of these. They're THAT good. I think one of my projects this summer will have to be to figure out a nice little lunchtime shrimp salad that incorporates miso, orange, and sesame. That, with a glass of prosecco, would make me a very happy girl. Resources: Dried soybeans, orange, limes, red miso, and togarashi from HMart; egg from Smith Meadows Farm; 365 canola oil; Domino sugar; David's kosher salt; cayenne pepper from TPSS Co-op; shrimp and chives from Whole Foods. Music to Cook By: The Bird and The Bee; Interpreting the Masters Volume 1: A Tribute to Darryl Hall and John Oates. One of my favorite duos covering the songs of one of my other favorite duos? If loving this is wrong, I don't wanna be right. You can just buy yuba in any Japanese store. 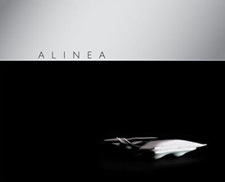 The rest of it looks relatively straightforward by Alinea standards. I bet it works great even without the complex plating. I was sick in bed the past few days, so I didn't see your April Fool's Day post until today. It's a good thing you 'fessed up, otherwise I'd be on your case about scheduling stops in Des Moines and Denver, but omitting Omaha which you'd be driving through. To get from Little D to Big D, you HAVE to go through Omaha. But, you're not really doing it, so I'm not on your case. Heck, yes, it does sounds like fun! Hey, just do it. Tell Food Network--I think there's a new series here! That looks so pretty, and the flavor combo does sound excellent. Also, this is the second miso condiment I've seen in two days (Brian Boitano made miso mustard yesterday on his Food Network show). I feel like the universe is trying to tell me something. Something salty. Not only can you buy yuba at any Japanese or large Chinese grocery store, you can also buy it in dehydrated rolled up stick form. That was fun! I especially like how you didn't post the comments that called you on your joke. I don't live in the US, but GET SPONSORS AND MAKE THE ROAD TRIP HAPPEN. You could totally, totally do this, CB - perhaps as your swan song after you've finished the book, say early - mid next year when I'm visiting your country? Yeah, totally. I'll see you then. Hey Carol, the Yuba is actually a pretty common ingredient in Chinese cuisine (often used in soups and stir-fried), and you can find it in most Asian grocery stores. I think there are Super H-marts (korean supermarkets) that should carry them. You can get like 20 sticks for $1.99 or so. Maybe not quite as tasty as freshly made, but better than spending 2 hours making 8 of them! So nice that you're such a fan of April Fools Day. I am too: it's my conception day. When I counted backwards and realized the fact and mentioned it to Mom, she got a far-away look in her eyes and said, "Hmmm, maybe so. We had gone to a Halloween party that night..." "Halloween?" "Well yes. It was April Fools Day!" That explained a whole lotta things to me! Looking forward to see how you top this one next year. Ah, but did you serve them in eco-friendly, biodegradable mini shot glasses? That line? That was the part that made me snort so hard I scared my cross-eyed cat. Brava. The shrimp/orange/miso flavor combination sounds really interesting. I could see it working well in other contexts...like taco filling, or a salad? Must play. I'm going to need to spend a day or two making gallons of that soy mayo -- or as I like to call it, vegetable gravy. It takes a deep southern accent to fully describe the effect of that deliciousness drizzled over grilled asparagus: "Daaaaaaaay-yum!" Thanks for the info on the Farm Day! I just signed my family up for it! It sounds like a great time!!!!! I know my kiddos will love it! As to the 4/1 - I think when I finally tried to leave a comment, you had already shutdown for new entries, but I thought it was your best ever! sob. . .so gullible. . .so deflated. seriously, it's been a while since I've been as disappointed about anything. now I'm conflicted, to boot. Can't decide to congratulate your wilyness, or curse your deception. . .
these were one of my favorite courses when we ate at Alinea last year. So cool to see what goes into making them. Do you cook the mayo in any way? Since it has egg it feels like you should, but I don't see it in the directions or your description.